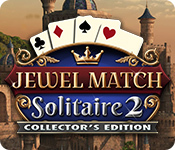 Jewel Match Solitaire 2 Collector's Edition is rated 3.7 out of 5 by 12. Rated 5 out of 5 by Ruckus777 from SO.MUCH.SOLITAIRE!!! Like one of the other reviewers said, this is how a Collector's Edition should be! So much content that you will be playing for a long, long time! Tons of regular levels to play and many different unlockable bonus solitaire games too! The card backs and faces are really awesome and can completely change the look and feel of the game. The castles that you build are gorgeous as well! It truly is a visual treat. If you love the up/down style of solitaire as much as I do, you NEED this game! Rated 5 out of 5 by Capri66 from Great ! Jewel Match Solitaire 2 is a very solid solitaire game. It predominantly features the one-up, one-down style (tons of levels! 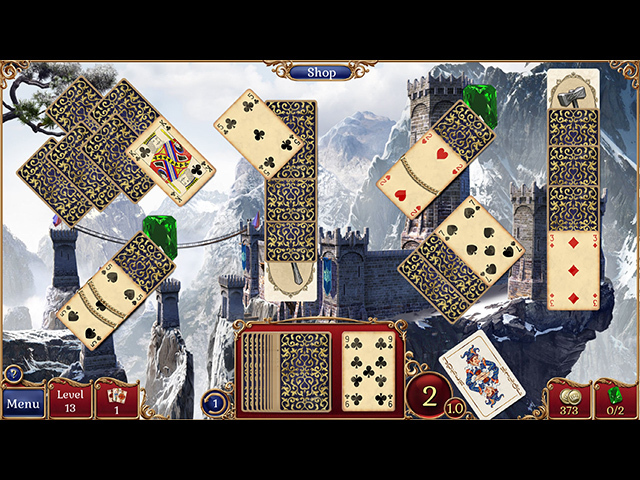 ), but also has other variants of solitaire (klondike, freecell, etc.) that can be played as bonus games. 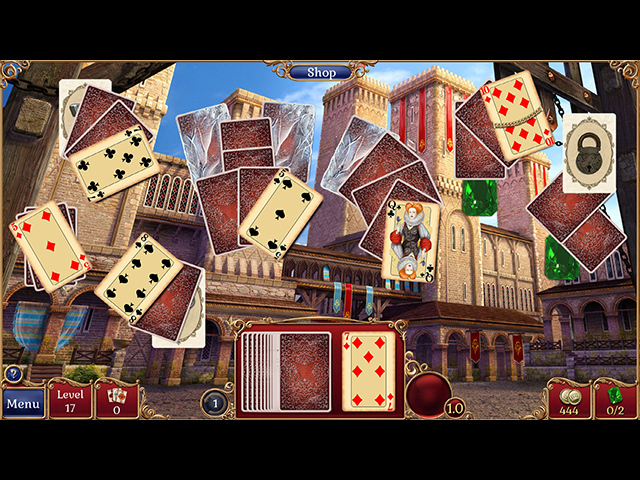 Bonus games are unlocked gradually through the game, each being a different kind of solitaire. I've learned a couple of new versions that I like a lot. Lots of replay value with the different difficulty levels and bonus games. Thumbs-up. Rated 5 out of 5 by reidun70 from Jewel match the best of the best! When a new game is comimg out i be like a litle kid on christmas day! Love the hole serie, Enjoy people! Rated 4 out of 5 by CLUELESS35861 from plenty of levels, fun in hard mode, trophies are glitchy the castle theme is getting tedious, but, there are plenty of levels. the trophy case has glitches, there are no credits to view, so it impossible to "view all credits" to earn a trophy; bought every single thing in the shop, still no trophy; better than some of their later efforts. Rated 3 out of 5 by imatryin from Monotonous Had fun getting 3 stars for about 15 levels then I found it got extremely hard and getting 3 stars became hit and miss, more mis than hit and this is in relaxed mode. The more I got into the levels it became slow going takes ages to get enough coins to buy upgrades..Wished I had tried before buying as I would not have bought this one. If you want to collect the whole JM serious then fine I recommend it. Rated 3 out of 5 by CyndiLouWho2 from Again with the castles? Here's the thing -- I absolutely love Jewel Match solitaire games. The graphics & animation are beautiful, the music is relaxing and there are lots of power-ups to buy and castles to build. The games are are lovely to look at and always a pleasure to play. So what's my problem? Well, I felt like I was playing the previous game they put out months ago. Nothing's new, everything is pretty much the same including a lot of the background scenery. And why do we always have to build castles? Why can't we furnish rooms or build an amusement park or something? As with a lot of creative developers, they tend to get lazy and keep re-hashing the same game over and over. I own all the previous Jewel Match Solitaire games so I won't be buying this one; I can simply replay the ones I have. However I'm recommending this game because it's one of the best solitaire games out there. And if you've never played any of the previous versions, you'll really enjoy this one. Rated 2 out of 5 by cowclaudia from Boring and monotonous I love and own all the previous Jewel Match games so immediately purchased this and frankly I find it's boring and at times monotonous. I've never in their previous solitaire games had to constantly re-deal like this even with purchasing extra cards. As you progress further into the game it's just constant clicking trying to clear cards and getting paralyzed with boredom re-dealing over and over just to get one emerald, and noticing you need a ton more of them to complete a scene. On the up side the castles are beautiful and am using one as a wallpaper from one of the earlier levels but otherwise leaves me cold and just may not buy anymore Jewel Match.